Amazon's Appstore for Android opened for business Tuesday offering a free paid app every day, one-click purchasing, and the ability to test drive apps before you buy making it a formidable challenger to Google's own Web-based Android Market. Here is a quick look at what's available on Amazon's Appstore for Android. You can access the new appstore directly here. The Appstore will feature a free paid app every day. 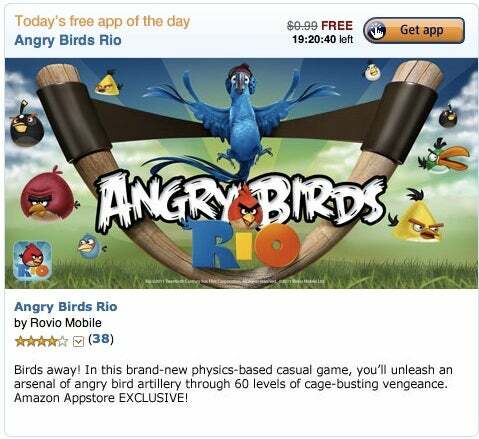 Tuesday's free app is Angry Birds Rio--a spin-off of the popular mobile game based on the new animated movie RIO. The app's regular selling price is 99 cents and the game is available exclusively for Android on Amazon's store and on iTunes for iOS devices. There is also a deals section on the Appstore where you can find discounted apps. Google's Android Market lets you return apps for a full refund within the first 15 minutes after you buy. Apple, by comparison, does not allow for trial periods on iOS devices. Amazon is taking a similar approach to Google by letting you test drive apps on your PC. "You control the app with your mouse and experience it like you would on your phone," Amazon's Test Drive Apps page reads. The feature lets you try the app within your browser before you decide to buy. This feature appears to be reserved for some of the more popular titles and may not be available for all apps. Amazon's Appstore also has a downloadable app for your device that you can find a widget for on the right hand column of the homepage. The widget prompts you to enter your e-mail or mobile device number to get started and then you will receive a download link to get the Android Appstore on your mobile device. The Android Amazon Appstore app is required for Web-based purchases. First you buy or select a free app from Amazon's Appstore and next you go to your Android phone and launch the Amazon Appstore to download the app to your phone. The Appstore has nearly 30 separate categories including Books and Comics, Education, Entertainment, Magazines, Music, and Productivity as well as a number of separate game categories. However, the store is missing some major titles. In social networking, for example, Amazon doesn't offer an official Facebook app for Android, but does offer apps for Twitter, Whrrl and Wordpress. Keep in mind these are early days for the Appstore and more titles are likely to appear in the coming weeks. Amazon's top 20 paid and free apps were dominated by popular games including three Angry Birds titles, Uno, Fruit Ninja, Doodle Jump Deluxe, and Asphalt HD. But there were also a few other apps such as the popular music-identifying app Shazam Encore, Documents To Go, IMDB and WeatherBug Elite. Amazon's Appstore is off to a strong start, but the new entrant into mobile apps does have a few headaches to deal with such as Apple's lawsuit against Amazon filed on Friday. Apple is accusing the online retailer of infringing Apple's rights on the name App Store.